Eco Retreat - Hekpoort Accommodation. 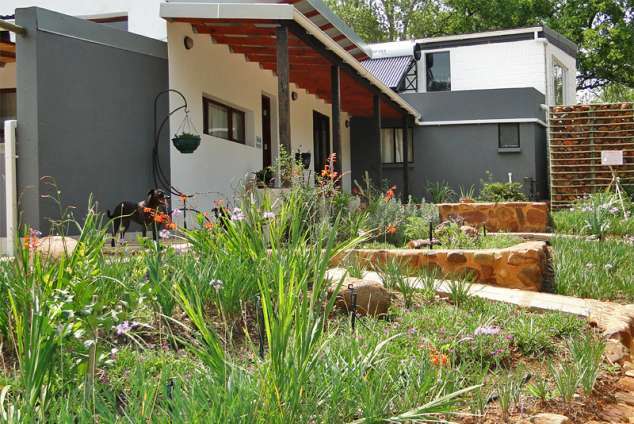 The Eco Retreat self-catering home in Hekpoort is nestled between the Magaliesberg and Witwatersrand mountain range along the Magalies River. Restore and revitalize your soul in our secluded spacious "wooded" bush environment and connect with nature. Wake up to the sounds of birds in the river reeds or monkeys canopying from tree to tree. Our wooded canopied braai area is ideal for a shaded lunch time meal. An open Boma fire pit is there for you to enjoy the starry night listen to the concert of the frogs and jackals cry in the distance. Great for families and friends (1-12 people), ideal for yoga and wellness groups, retreats, workshops, cycling and walking. What makes this Eco space special is the way in which reclaimed materials have been up-cycled, like the old windmill and furniture, and building materials sourced from the property, like the stones and reeds. Solar panels have been installed for hot water and water tanks to collect rain water. Little touches like the food and herb garden complete the green picture. Find the R560 national road at the Hartbeespoort Dam area. At Skeerpoort travel towards Hekpoort and Magaliesberg, approx 14 km from Skeerpoort on the R560 turn right at the Mokoya Lodge road sign, follow the pointers to Mokoya Lodge. We are right next door to Mokoya Lodge. From Krugersdorp take the R563 national road towards Hekpoort. At the T junction turn right on the R560 and follow the above to Eco Retreat. 10653 page views since 04 Feb, 2016.